Acceleration of studying and following Ho Chi Minh’s thought, ethics and lifestyle under the Politburo’s 05-CT/TW (12th tenure) represents sentiment, responsibility, opportunity and facilitator for building the Naval Service’s strong organization and staff, contributing to improving its synergy and combat strength, meeting the requirements of protecting national waters and islands in the new era. President Ho Chi Minh ever said to Naval troops: “Yesterday we only had night and forests. Today we possess day, sky and sea. Our coast is long and fine; thus, we have to protect it”. Uncle Ho’s teaching has become the Naval Service’s goal, motto and guidelines throughout its process of building, fighting, triumphing and maturing. In the face of the requirements set by the tasks of making the Service revolutionary, regular, elite, modern and managing and protecting national waters and islands, the Navy’s Party Executive Committee and High Command are actively speeding up the “study and following of Ho Chi Minh’s thought, morality, lifestyle”, preserving and promoting qualities of “Uncle Ho’s soldiers - Naval soldiers” as a central measure to making the Service politically strong and enhance its synergy and combat strength in the new period. To achieve the high efficiency, the Navy’s Party Executive Committee and High Command have directed all-level party executive committees and commanders, branches and organizations to study and follow Ho Chi Minh’s thought, morality and lifestyle in a comprehensive, synchronous, flexible, focalized manner via specific models and approaches. During the process of developing programs and plans for the implementation, units have selected and identified proper content and criteria, while focusing the following on building pure, strong party organizations and comprehensively strong units as well as completely overcoming their weaknesses. The study and following has been always combined with the implementation of the Campaign “promoting tradition, devoting talent, deserving to be Uncle Ho’s soldiers - naval soldiers”, the Resolution of the Party Central Committee’s 4th Plenum on Party building and rectification, “Determined to Win” Movement and other campaigns. In spite of various components, forces and units which operate independently and separately in seas and islands in harsh weather and regularly encounter tense, complicated situations, agencies and units, particularly those directly performing the task in seas and islands, have actively renovated content and forms of education and propagation. Significance has been attached to forms of education via reality activities and example setting. Specialized meetings, competitions, forums and dialogues have been regularly organized. Pocket-sized documents have been compiled and given to troops for their self-study. Grass-roots level cultural institutions have been brought into play to propagate typical examples in the study and following Ho Chi Minh’s thought, ethics and lifestyle, thereby arousing troops’ pride in the Party, beloved Uncle Ho as well as glorious tradition of the nation, military and Service, promoting comradeship and love for seas, islands, ships and stations, and making them consider the study and following of Uncle Ho as a task of daily routine. Grounded in the main elements of Ho Chi Minh’s thought, ethics and lifestyle, 6 common moral standards in the military and 5 points pertaining to deserving to be “Uncle Ho’s soldiers” in new era, the Navy’s Party Executive Committee and High Command promulgated the system of norms for studying and following Ho Chi Minh’s thought, ethics and lifestyle, intended for the whole Service and its Party Committee. At them same time, the Service has directed its units and mass organizations to concretize the standards relevant to their assigned tasks and functions. Following the motto “study must be in parallel with following, and the latter must be realized by actions”, since 2016, the entire Service and its Party Committee have been stepped up the implementation of breakthroughs and the building of strong party organizations, thereby setting and multiplying good, effective models and hundreds of typical examples in implementing the Directive No.5. Those include: the movement “studying and mastering modern weapons and equipment” in the Naval Region 4, Brigade 189, Brigade 954; the model “typical young researchers and technicians” in the Naval Technical Institute; the movements “building and promoting the particular cultural tradition of submarine” and “exemplary submarine sailor teams” in Brigade 189; “10 good deeds” in Naval Hospital, etc. In the conference to review the 3-year implementation of the Campaign “Promoting tradition, devoting talent, deserving to be Uncle Ho’s soldiers - Naval soldiers” in line with the implementation of the Directive No.5, held in April 2017, 350 individuals in the Service were awarded and honoured (including 5 ones awarded and honoured at army-wide level). It is the acceleration of setting and multiplying the above-mentioned typical examples that contributes to the increasingly effective implementation of the Directive No.5. Concerning the Party building, successfully implementing the Directive No.5 has helped enhance leadership capability and combat strength of party committees and organizations as well as the quality of cadres and party members. Mass organizations and soldiers’ councils have been made strong and operated effectively in accordance with their functions. Cadres and troops absolutely believe in the Party’s leadership, the State’s management, the Service’s capabilities and combat power as well as in victory of the cause of safeguarding seas and islands, being exemplary and active in performing their missions, showing their readiness to fight and sacrifice themselves for protecting national waters and islands. The Party’s ideological battlefield within the Service has been maintained and consolidated. During the course of carrying out the tasks of training, combat readiness, regular building, discipline management, Naval staff always show their political will, pure revolutionary ethics and absolute loyalty to the Party, Homeland and people. 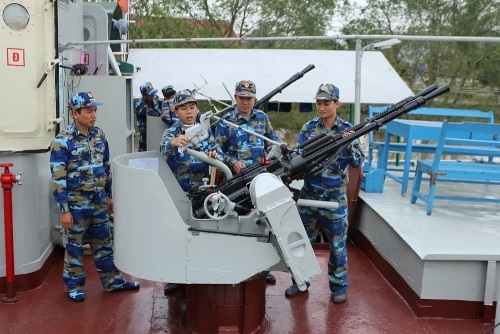 They have been active in studying, receiving, transferring and quickly mastering modern weapons and equipment, maintaining vigilance and readiness to fight, resolutely and persistently dealing with situations in the sea, contributing to safeguarding national waters and islands, preserving peace for national development. In addition, the Service is among top units which have effectively conducted the work of propagation on sea and islands as well as search and rescue operations, protecting and assisting fishermen. In 2017, the Service deployed more than 140 vehicles of all types and over 3,600 cadres and troops to conduct 134 search and rescue operations which saved 141 people and 14 fishing boats and supported repair of tens of ships and boats in the sea. Those have greatly contributed to maintaining and consolidating the military-people unity, the political and spiritual potential and the posture of “people’s hearts and minds”. To continue accelerating the study and following Ho Chi Minh’s thought, ethics and lifestyle within the Service, its Party Executive Committee and High Command have proposed the main measures as follows. First, strengthening all-level party committees and organizations and commanders’ leadership and direction over the implementation of the Politburo’s Directive 05-CT/TW and the Central Military Commission Standing Committee’s Directive 87-CT/QUTW. To this end, it is necessary to step up propagation and education to raise the staff’s awareness and responsibility for the study and following of Ho Chi Minh’s thought, ethics and lifestyle in tandem with the implementation of the Campaign “promoting tradition, devoting talent, deserving to be Uncle Ho’s soldiers - Naval soldiers”, the Resolution of the Party Central Committee’s 4th Plenum (12th tenure) on Party building and rectification, the “Determined to Win” Movement and other movements and campaigns launched by all echelons, sectors and organizations. The Navy strives to be an exemplary force in the study and following of Uncle Ho, and the vanguard in preventing and fighting against degradation, negative phenomena, “self-evolution” and “self-transformation”. Second, promoting the role and responsibility of party committees, commissars, commanders, political offices and assisting sections at all levels, while actively renovating way of thinking and approaches from superior levels to inferior levels. Cadres and party members must be examples for the masses to follow. Regular and specialized meetings of party cells and mass organizations about the study and following of Ho Chi Minh’s thought, ethics and lifestyle must be organized effectively. Third, actively renovating and diversifying content, forms and methods to implement the Directive No.5 in accordance with characteristics of the missions as well as the assigned tasks and responsibility. It is important to attach the results of studying and following Uncle Ho to the building of pure, strong party organizations and comprehensively strong units. Due attention should be paid to setting and multiplying typical examples in implementing the Directive No.5. Fourth, significance should be attached to the commendation work and the work of propagating typical examples. The results of studying and following Ho Chi Minh’s thought, ethics and lifestyle must be used as a criterion for assessing the task performance of each individual and collective. At the same time, it is vital to maintain the order of inspection and supervision during the course of implementation. Great importance should be attached to holding review and drawing lessons on the study and following Ho Chi Minh’s thought, ethics and lifestyle. Grounded in the recorded results, in the time to come, Naval Service will continue to accelerate the study and following of Ho Chi Minh’s thought, ethics and lifestyle as the basis for the improved overall quality and combat power, making it really the core in managing and safeguarding national waters, islands and continental shelf.